WASHINGTON, D.C. -- About one in six U.S. employees are nonsalaried hourly workers who say the number of hours they work from week to week varies. Moneywise, the majority of this group does not consider the variability in work hours a problem, with 67% saying their variable hours do not cause them financial hardship. Does the fact that the number of hours you work each week varies cause you financial hardship or not? These results are based on interviews conducted Aug. 23-Sept. 4 with 528 hourly workers who say the number of hours they work each week varies. Thirty-seven percent of all hourly workers -- equivalent to 18% of all U.S. workers -- say the number of hours they work varies from week to week, while the rest say their hours are fixed. A recent New York Times story highlighted the possible negative effects of unpredictable and variable working hours, suggesting that the lack of a fixed schedule causes workers stress and financial hardship. The issue is one of potentially increasing importance as the economy transitions from one in which most workers can expect traditional full-time and lifetime employment. The results of Gallup's special study on this population of workers with variable hours indicate that while some report not getting enough work hours and likely suffering financial hardship, this represents the minority of such workers. Additionally, the estimated 6% of all employed adults who say they are experiencing hardship as a result of varying hours is small on an absolute basis, although it could certainly have economic and social implications for those who feel this way. Moreover, 29% of all variable-hour workers (or about 5% of all workers) say they wish they could work more hours, while 69% are satisfied with their weekly hours. Many workers with variable hours actually like it that way, with a modest majority (52%) saying they would prefer their hours to vary and 44% saying they would like a consistent number of hours per week. Regardless of whether they prefer it, the majority (57%) of those who work variable hours apparently have little choice in the matter, because they report that their employer determines the number of hours they work each week. Thirty-six percent of these workers say they choose their own hours. Workers who have variable hours tend to be younger, with lower education levels and lower income, when compared with the overall U.S. employed population. Work schedules with varying hours have existed for many years, although it is quite possible that with an increasing emphasis on "gig" employment, this type of work will increase in the future. But dissatisfaction with varying, unpredictable work hours does not appear to be a major problem in the U.S. today. Gallup research shows that this situation affects only about 18% of the working population, and a minority of those who work variable hours express negative feelings about their hours or their pay. Although the group believing that their variable hours cause financial hardship is small on a relative basis, it is still a problem on an absolute basis for those negatively affected. In particular, variable hours could be problematic for those who want consistency in their weekly schedule or have regular financial commitments that suffer because their hours vary. On the other hand, variable working hours could provide flexibility for students or those who have retired from their primary career. Gallup data show that a majority who work in this particular framework are satisfied with the consistency of their weekly schedule. In general, despite some media reports to the contrary, those who are involved in this work lifestyle appear to be content with at least some aspects of their irregular schedule. 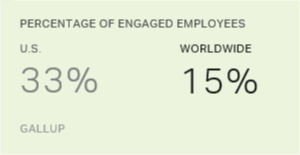 Results for this Gallup poll are based on telephone interviews conducted Aug. 23-Sept. 4, 2017, with a random sample of 1,490 employed adults, aged 18 and older, living in all 50 U.S. states and the District of Columbia. For results based on the total sample of employed adults, the margin of sampling error is ±3 percentage points at the 95% confidence level. For results based on the total sample of 528 hourly workers whose hours vary from week to week, the margin of error is ±5 percentage points at the 95% confidence level. All reported margins of sampling error include computed design effects for weighting.